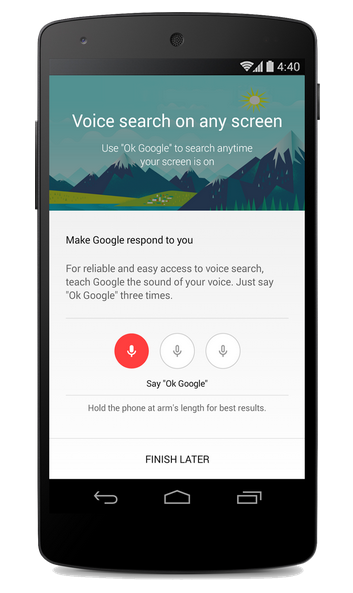 Google Settings -> Search & Now -> Voice -> “Ok Google” Detection and check “From any screen”. To respond to your voice better, you’ll be prompted to turn on Audio History and then say “Ok Google” 3 times. This way, Google will do a better job recognizing your voice and helping out when you ask. Finally, if you’d like to be able to search even when your device is locked, just enable the “From lock screen” option. “Ok Google” from any screen will be rolling out on most Android devices running KitKat over the next week, and will initially be available in the US for English speakers. Check out this page to learn more about what you can do with voice search. Whether you’re getting the latest news about the World Cup or trying to find showtimes for 22 Jump Street, many of you kick off your search with a simple “Ok Google” from the Google Search app or the Google home screen widget. Now voice search is going to be even easier to get to. Starting today, you can say “Ok Google” on your Android device whenever the screen is on or your device is charging. If you’re reading your email, browsing the web or using any app that doesn’t actively use the microphone, saying “Ok Google” will get you the answers you need and let you take actions like set an alarm or call a friend. So the next time you’re in the Google Maps app looking at places to visit for your upcoming trip, just say “Ok Google, what is the weather in Dallas?” and Google will display the weather forecast right on your screen. Once you’ve decided to pack shorts this time around, you can tap the back button to finish what you were doing in the Maps app. So feel free to say “Ok Google” anytime and anywhere—and Google is there to help.